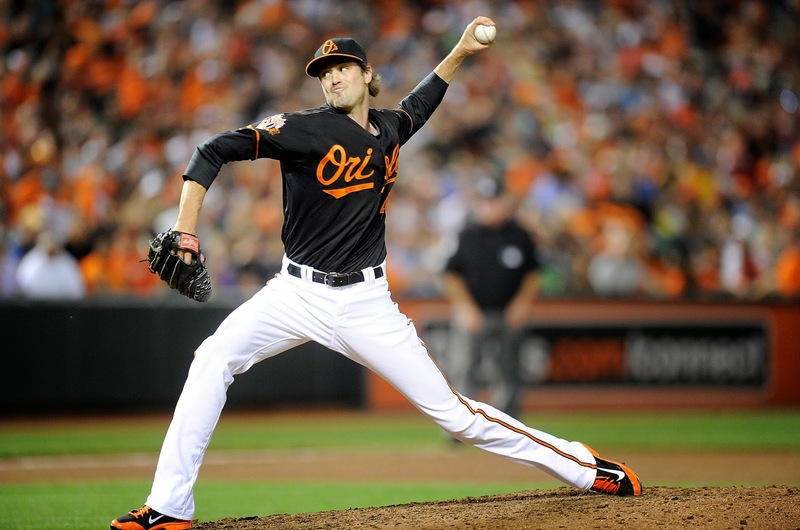 Yesterday, ESPN’s Buster Olney reported the Yankees were in serious pursuit of left handed reliever Andrew Miller. He also noted he expects the lefty to sign a four-year deal wherever he ends up. I was honestly surprised at this as it seemed the Yankees were going to end up grossly overpaying for the likes of David Robertson. I am quite happy to see the Yankees are pursuing Miller and are doing so in what appears to be an aggressive manner. Miller would do a lot of things for the Yankees. First and foremost he would be a lockdown left handed reliever which the Yankees have been without for a long, long time. It would appear that he would slot in either as the closer or set up man with Dellin Betances taking over whichever of those roles the lefty doesn’t occupy. I am all for this and would prefer to give the 9th to what seems to be Mariano’s heir apparent in the D-Train, but would be happy either way. When we add in the bounce back potential of Justin Wilson who was lights out a year before the last’s disappointment, the Yankees could be looking at a three-headed monster bullpen much like the one Kansas City had that led them to the World Series. Additionally signing Miller in all likelihood would appear to mean Robertson won’t be resigned. ESPNNY’s Andrew Marchand reported that said scenario doesn’t mean the Yankees wouldn’t consider, but did note that they are not willing to pay what Robertson is currently asking for even without the addition of Miller. I personally have been quite vocal about letting Robertson walk and this would be a great scenario to do so. When you delve deep into Robertson’s numbers it is revealed that while he’s a great set-up man, he’s not a great closer and I would have headache if the team met his ridiculous demand and paid him what he thinks he’s worth. I say bring in Miller (who won’t cost draft compensation) and let Robertson walk and save a little money and collect a draft pick. This would allow the Yankees to make a much needed splash on Max Scherzer. Yes, there is a draft pick attached to Scherzer, but we wouldn’t exactly be losing one if we gain one by letting Robertson sign elsewhere. It’s a no brainer to me. I wrote last night about just how dominant Scherzer has been and signing him would allow us to trade excess pitchers for bats which would be boosting the team all the way around. As far as the Scherzer front goes, Chris Cotillo posted yesterday teams are waiting out Lester and Shields and expect them to sign first with Max waiting until late in the offseason. Not really what I wanted to here, but then again multiple sources have stated Lester will most likely sign this week, so the wait might not be terribly long. It was reported this Saturday by Dan Pfeiffer that the Yankees either had made or were preparing an offer to Scherzer. When YES Network’s Jack Curry tweeted in disagreement Pfeiffer stated the same source that broke the Ellsbury signing last year was behind the report on Scherzer. Hard to know what to believe, but I am actually leaning towards Pfeiffer’s side at this point. Yes, partially because I’m hopeful, but the man has no reason to lie to us and clearly has a proven source feeding him information. Just because the Yankees are preparing an offer doesn’t mean they will get him though, so try and temper expectations (I will try and heed my own advice). I do think the Yankees will sign him, if nothing else it seems they’re the only team interested and willing to pay big, but we will see. Boy, wouldn’t it be great to counter Boston’s offensive duo with a lights out pitching duo that ultimately doesn’t cost us a draft pick? I will likely have to keep dreaming, but stay tuned for further updates on the Yankees and this offseason.